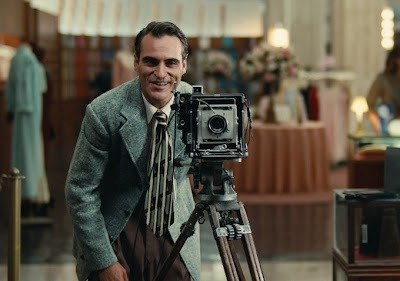 Paul Thomas Anderson doesn’t have the quantity of directed films under his belt, but the quality of his work is undeniable. There Will Be Blood, I still contend, is one of the best films made in the last ten years. Anderson has transitioned throughout his career, but his themes of greed, violence, and new beginnings have remained a constant source of inspiration. 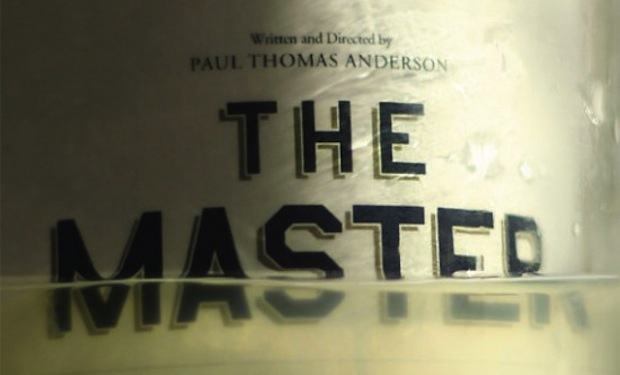 The Master is grandiose and awe-inspiring, but it’s also complex and confounding, all these qualities composed to make an altogether fascinating and beautiful film experience. Freddy Quell (Joaquin Phoenix) is a lost soul, damaged psychologically by his service in the Navy during the Pacific war but also by an affliction towards self concocted liquor. Quell is an emotional wreck living in the looming shadow of post WWII, angry, frustrated, depressed, manic, at times individually but mostly wrapped together chaotically. Quell, purposeless after two failed job attempts, drifts aimlessly into the company of one Lancaster Dodd (Phillip Seymour Hoffman), the leader of a quasi-spiritual group known as The Cause. Dodd immediately becomes intrigued with Quell, to the point of calling him his protégé; but he is also his personal experiment for application of his ideas. Dodd is a charming showman, radically defensive of his beliefs yet compassionate towards his followers. Dodd is not alone in his quest; his wife Peggy (Amy Adams) is vastly influential to foundations of The Cause. Quell and Dodd quest America together, searching for self-realization and affirmation of faith. The Master roams about themes of faith, failure, and vanity. Quell struggles with elements of trust while Dodd is consumed, possible fooled, by his own manipulations of it. Failure is throughout; each character seems to be defined by pasts marred by disappointment. Vanity influences most of Dodd’s impetuses while Quell is altogether too proud to admit his faults or allow room for change. While these are great qualities to explore in a film, Anderson only allows so much explanation or verification of the ideas observed. He also doesn’t allow for much doubt, and in a film concerned with extremist faith, that can be confusing. It’s a difficult execution for a narrative even in the capable hands of Anderson. The performances are magnificent. Phoenix is hunched and haggard, moving through life with no cognizant idea of the next step, consequence or otherwise. 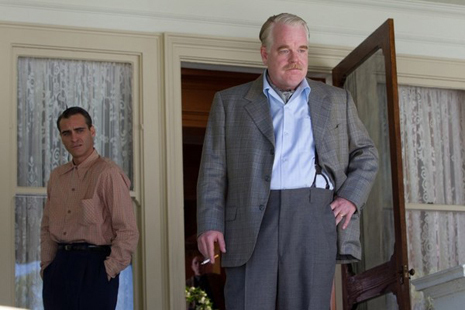 Hoffman is structured and charming, he moves throughout the film staggeringly confident. He sings, dances, gives speeches laced with hubris and bravado, all in an attempt to sustain any and all influence he has achieved. Amy Adams is the tie that binds and again stunning in another demanding role. Her character is one hundred percent dedicated to The Cause, possibly more so than even Dodd himself. She is both the calm and destruction of the storm. Hoffman and Phoenix are mesmerizing in numerous scenes, specifically an interview conducted by Dodd that leaves Quell an emotionally open book. Their characters balance and counteract each other and are ultimately necessary for both to exist. The cinematography is nothing short of inspiring, it’s impeccable. Depth of field, shallow focus, and vivacious wide photography mix with vivid color palettes and ambitious, sprawling locales. Add those with the 70mm format that the film was shot in, and the miniscule and major both hold authority over the viewer. Whether it’s the perplexing nature of Quell’s addictions and damaging motivations or Dodd’s deification and contention with his own beliefs, it will leave more questions than defined answers yet it’s achieved in the best possible manner. There is something altogether interesting about unexpected insights into the lives of others; it’s a quality that The Master ambitiously and expertly achieves.